Cut up chicken and add to the Instant Pot. Pour in broth, cover with lid and set the pressure release valve to the back. Manually cook for 8 minutes. Do a quick press release and take off lid. Let chicken cool before freezing. Save the liquid to make soup with. 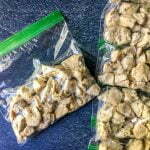 Divide the chicken into 6 freezer bags. Do not add any liquid. Make sure you get as much air out of the bags as possible. Flatten and write the date on the bag. Stack in the freezer for later use.